The upcoming Huawei nova 2 mid-ranger was certified by TENAA at the beginning of May. 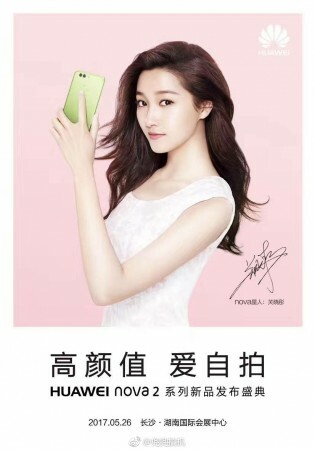 We already told you May 26 is the launch date, and now we know most of the device’s specs. The Huawei nova 2 will have 5.2” screen of Full HD resolution and will run on a HiSilicon Kirin 658 processor. The main accent in the phone is the 20 MP front camera, but there is a dual setup on the back as well. The two cameras will be 12 MP and 8 MP, and the fingerprint scanner will keep them company on the back panel. According to a leaked poster, the Huawei nova 2 will come in four colors - Blue, Green, Pink and Black (the last one is not confirmed since we see only the front of the device). Sources suggest the battery will be 3,000 mAh. 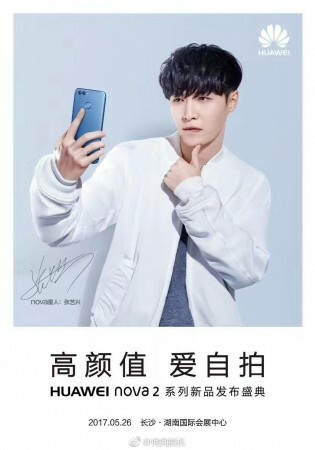 The device will be launched in the historical city of Changsha with the Chinese singer Zhang Yixing, better known as Lay, who also appears on posters with the nova 2. A bigger nova 2 Plus is also expected to appear at the launch, but information specs-wise is scarce. The Huawei nova 2's price will start from CNY2,500 or about $362.